James White was co-founder of the Seventh-day Adventist Church along with his wife Ellen and Joseph Bates. He was the fifth of nine children, and in early years had such poor eyesight that he could not attend school. At age 19, with his eyes improved, he went to school, studying 18 hours a day, and in 12 weeks had a certificate to teach. He later attended school another 17 weeks, making his total school time, 29 weeks. After a second year of teaching, James learned of the Millerite message from his mother, and committed himself to preaching the advent doctrine. In the winter of 1843, 1,000 persons were won through his preaching. He was ordained as a minister in the Christian Church in 1843. James remembered meeting Ellen Harmon before the 1844 disappointment, but their association did not begin until early 1845. James and Ellen were married by a justice of the peace on August 30, 1846. For the first six years of their marriage the Whites did not have a home of their own, living at times with her parents or with friends. In November 1848, Ellen White was shown in vision that James should begin to print a paper, and that it would grow until its light would shine around the world. Beginning in 1849 James published The Present Truth. It became The Review and Herald in 1850. Publishing was done through public printers for three years, in several locations. The Whites finally had their own home in Rochester, New York, in 1852. With borrowed and inexpensive furniture they set up housekeeping, sharing the home with several who helped in the printing. In 1855 the publishing work moved into more permanent quarters in Battle Creek, Michigan. James and Ellen White participated together in many enterprises. In 1848 they attended all six Sabbath Conferences in the Northeast United States, where a line of truth was established through diligent Bible study, in groups from 15 to 50. Ellen White's visions did not take the place of Bible study, but served to confirm their study, and kept the group from wandering into fanciful or fanatical beliefs. More such meetings were held in 1849 and 1850, and the Whites attended most of them. Visions given to Mrs. White often required her husband to take some action. In the 1850s it was organization. 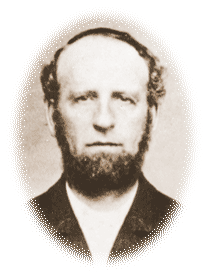 James was asked to be the first president of the General Conference when it was organized in 1863, but he declined in favor of John Byington. James then served as the second president, and for several other terms as well. Ellen's visions led to the establishment of the first Adventist college in Battle Creek in 1874. Again, James White was the chief promoter of this college. After suffering a severe stroke in 1865, James was taken by his wife to Dansville, New York, to a hydropathic (water therapy) institution. Though he received some help, there were several practices that did not agree with the concepts Mrs. White had been shown in vision. After three months, they went to Rochester, New York, where, on Christmas day, she had a vision that led her husband to establish the Western Health Reform Institute in Battle Creek the following year. This was the beginning of what was to become the Battle Creek Sanitarium. Thus, a college, a medical institution, publishing work, and organization--all were begun by James White, in response to visions given to his wife. Together, they gave strong leadership to the church for 35 years. He died at age 60 in 1881, leaving Ellen White to continue her work alone for another 34 years.